When I first learned, that the topic for the Finnish Pavilion at the Venice Biennale would be libraries I immediately realized that nothing would make a more appropriate theme from Helsinki’s perspective. Not only do we open a new world class central library this year, but we have also renewed our commitment to open knowledge, culture and arts through the new city strategy. Our vision for Helsinki is to be at the center of the global struggle for the position and importance of the tools for open and participatory democracy – the right to knowledge, the right to education and the right to public space regardless of one’s age, gender, race or social standing. According to the Greek philosopher Aristotle, cities exist for the sake of good life. Helsinki pursues this vision by seeking to create the best possible conditions for urban life; to be the most functional city in the world. Our functionality is based on the Nordic model of high-quality city services, transparent governance, and almost non-existent corruption. Bur good life requires more. Livability stems from the clean and safe urban environment, a unique cultural scene, empowerment of the communities and, perhaps most importantly, a feeling of trust between the citizens. Cities are responsible for ensuring social cohesion and creating favorable conditions for citizens to pursue their dreams. I firmly believe that cities are increasingly important in solving the most pressing global issues. Cities are exceedingly the trailblazers in putting solutions into action and finding practical answers to global questions. In Helsinki we live this mission true everyday. Our commitment to concrete action, bettering life for everyone and fostering global collaboration stems from the idea that no-one can be left behind. In a relatively small city like ours this seems self-evident. In an international scale this message from Helsinki can be life-changing. We are convinced that the best way a city can serve its residents is by providing the most progressive everyday life as a framework. On this foundation we can lay the necessary building block for a good life: appreciation of culture, education, dialogue, inspiration and empowerment. A city is a mere platform for ideas, innovations and dreams. It is our job to foster, to protect and to encourage the people who are in the center of making a city to a home. As trust has become one of the key issues effecting global politics and city development we are proud that our commitment to trust building is bearing fruit. One of the concrete examples of this continuing commitment is the library system that for throughout the Finnish history has provided an access to knowledge, education and self-development for anyone and everywhere. Today it is more important than ever to stand in the defense of democracy – trust, transparency, knowledge and understanding are at the core of this mission. Knowledge is the most powerful tool and we have always believed, that it is best used in the hands of the people. Hence it is more than appropriate that Helsinki builds a new central library, facing the Parliament house, on the very central lot of land with iconic architecture. However, the building is more than an architectural symbol – it is a living testament of our time. The exhibition at the Finnish Pavilion is named Mind-Building. It’s not necessary to underline its topicality. The buildings you see in the exhibition represent the Finnish way of thinking and the commitment to open society lived true everyday in our society. We are happy to share this vision with all here in Venice realizing that not every society is able to make this commitment. The way forward in the world is a combination of baby steps and giant leaps. Today with Oodi we are taking both. 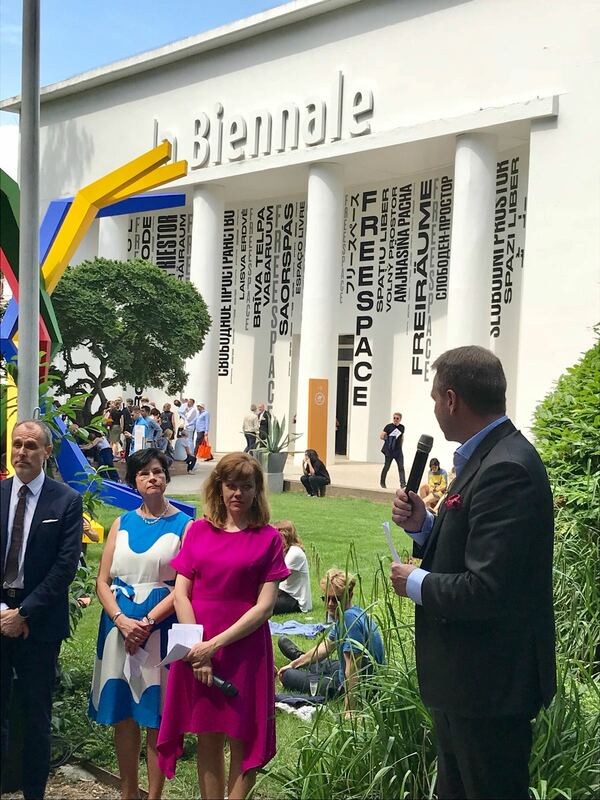 I want to thank the team behind this thought-evoking and concise exhibition – especially the Commissioner Hanna Harris, who’s organization Archinfo is in charge of the Finnish Pavilion for the first time this year. I also want to thank all who have contributed to the birth of the new central library Oodi. You have made meaningful history with a quiet voice.